Tomorrow is National Grandparents Day! To celebrate such a glorious day and to commemorate the bond that your children have with your parents, we have some great news to share. Turns out, letting Nana and Pop regularly take the kids will actually keep them healthier! 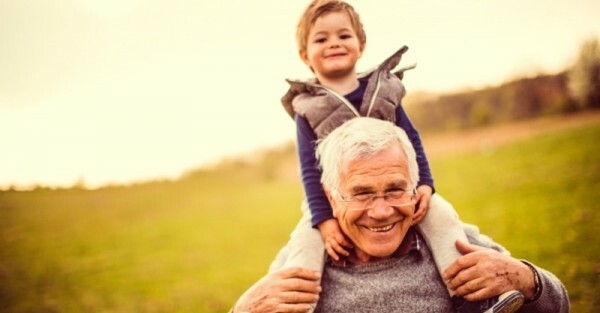 A study has confirmed that grandparents who take care of their grandchildren once a week may be at a lower risk of developing Alzheimer’s. In the study, conducted by the National Institute of Health, grandparents between the ages of 57 and 68 were given various tests of cognition. Those who scored highest were the ones who watch their grandchildren once a week. But interestingly, it seems too much of a good thing can have the opposite effect. Grandparents who spent five days a week or more caring for little ones scored the lowest on the cognitive tests which also confirms the theory that being a full time parent can actually turn your brain into mush. It’s easy to see how having a strong relationship with a grandchild is good for a grandparent. Another survey shows 63 per cent of grandparents admit they “do a better job caring for their grandchildren than they did with their own”. And any parent who has watched their children with a grandparent knows how important this relationship and this connection to family history and heritage is to their little ones too. Having a strong bond with a grandparent can help a child feel secure, confident and protected and help them to understand the power of unconditional love and the importance of family. So, make sure you thank your parents the next time they come over to watch the kids, not just on Grandparent Awareness Day tomorrow (October 25), but every day of the year. Because they deserve a lifetime of gratitude. And you deserve a night out every once and a while!